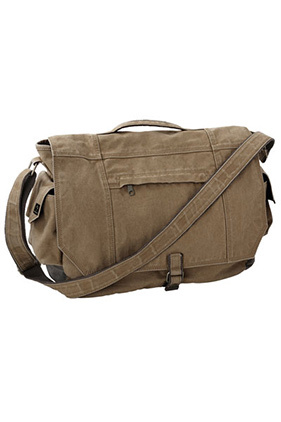 85% cotton/15% polyester, 12 ounce concrete canvas messenger bag. Adjustable canvas and webbing shoulder strap. Top carry handle. Zippered main compartment. Looped snap closure to secure flap. Padded laptop sleeve, fits most 17" laptops. Inside pocket. Zippered pocket on outside flap. Side snap pockets.